As shutdown continues, some brewing companies wait for label approval on new beer. A Pinellas County brewing company is waiting on approval for 4 seasonal beers. The Alcohol and Tobacco Tax and Trade Bureau does not have employees working during the shutdown, according to its website. CLEARWATER, FLA.- The government shutdown is impacting the brewing industry as companies wait for label approval for beer cans. 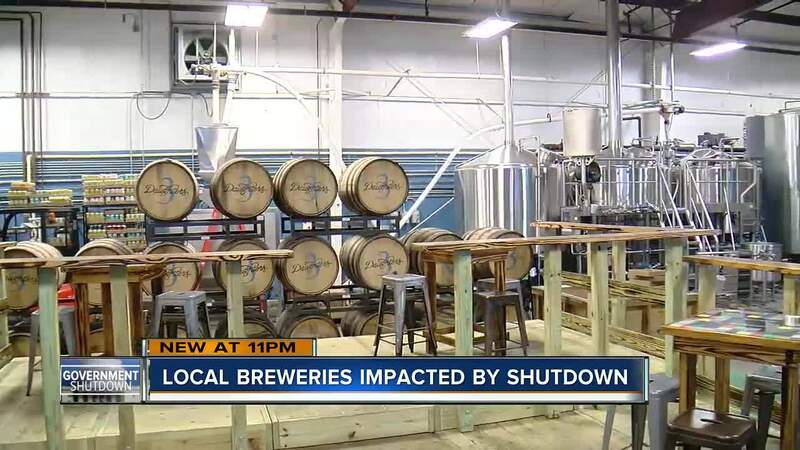 Leo Govoni with Big Storm Brewing Company in Clearwater said the shutdown is causing delays at their sister brewery, Fat Point Brewing in Punta Gorda. "This year, we had a huge relaunch of the brand, the Fat Point brand that we are now having to scrap, shelve or adjust some seasonal releases. Unfortunately, I don't think it will get done in time," said Govoni. The Alcohol and Tobacco Tax and Trade Bureau approves labels for beer. Fat Point Brewing is waiting on the approval for four seasonal beers. The TTB website states, "TTB has directed employees NOT to report to work." "Once funding has been restored and the government shutdown is over, we will work to restore regular service as soon as possible," the website stated. "We need preapproval so we need to design a label and submit it to the TTB and then they look at it, and either approve it or they ask us for some changes," said Mike Harting, owner of 3 Daughters Brewing in St. Petersburg. Harting said the government shutdown is not impacting his company's production, but the brewing industry is about what's next and new. "The idea of just having one or two beers a year, that's not what this industry is....we'll try 12, 14, 18, 20 different beers in a year," said Harting. Harting said a government shutdown in 2013 delayed the opening of his St. Petersburg brewery. "The last government shutdown was 5 years, 2 months ago and we were actually 3 weeks late in opening because that process just stopped. We sat here in a built brewery waiting for the next loan payment to come in, but we weren't allowed to sell beer," said Harting. Those in the brewing industry said the shutdown causes them to miss opportunities, but they feel for the employees who are missing a paycheck. "We would like to see a resolution as I'm sure everyone would," said Govoni.